Top Interior Decorators Bangalore, Bangalore is a city of fashion; these fashions are not just on dress we wear but also in all other parts of lifestyle. So, this trend has made the field of interior designing also high in competition. Designing field is meant for person who have personal interest on it further than doing it for sake of his/her duty. All the designs of a interior designer requires a good imagination. When an interior designer is interacting about the design required by the client, he/she must try to have a quick sketch of it to the customer. A designer must be capable of understanding most of the needs before the client explains as some needs are based on their caste, religion, society etc. Stairs is an important element while designing the interior of a house. Even a house with only ground has a stairs. Not only all the rooms have to be carefully designed but also the stairs also have to be designed carefully. While designing the stairs, we at Magnon, mainly classify it into 8 types. Although we may provide you suggestion’s on which design could look good for you, the final decision is on you to choose the best among different types of designs available. As we know it is the clients who are going to be the part of the house for the future time period. For every home interior, there is a hidden beauty that can be only identified by an expert interior designer. At Magnon as one of the top Interior Decorators in Bangalore, we are very creative in bringing out those hidden beauty to you. Also, we know in interior designing today’s fashion trend will not stand the same for tomorrow. Straight Stair with central landing. At Magnon, we have classified stairs as above. Straight stairs is named by this name as the stairs are straight without any turning points between the stairs. Straight stairs is easy for going up and down and with minimal design it is one of the easiest to design. But the problem faced while designing such stair is that it uses a huge amount of linear space. Comparing to all other stair design it is further easy to measure and start designing. Handrail for this type stairs are easy to make as there is not much bend for this type of handrail. Our expert is one of the best in maintaining our position as one of the top Interior Decorators in Bangalore. Straight with central landing stair is similar to that of straight stairs. But the only difference is that there is a central small space between the stairs. It is better when a person climbs the stair feels uncomfortable, he/she can take a break as there is small space to rest your body tiredness. As same as the above these stairs also have same advantage and disadvantages but one difference is that it may take more linear space compared to that of straight stairs. L shaped stair is a stair having bend in between the stair. These bend is mostly designed from a landing point between the stairs. Most of the L shaped stairs are having a bend of 90 degree. It is much good looking compared to that of straight stair and L shape can give a visual barrier for other while you are climbing the stairs. They can also be designed at the corner of the walls of the interior of your house so that the space is well used. Further, as same as the straight stair with central landing this stair also has the advantage of having space between the stairs to rest while ascending. But one of the disadvantages compared to the above type of stair is that it takes much more time to build. Handrails also take time to be built as it has some bends. This is a type of L shaped stair but instead of flat landing this stair has a small triangular shaped corner stair. This type’s of stairs is a new trend as it is seen mostly in modern type houses. As well as it is sometime requires lesser space compared to that of other stairs. And also it has the same similar advantages and disadvantages of L shaped stairs. U shaped stairs is an upgraded version of L shaped as from the flat land it takes U turn to next stair. It has a 180 degree turn compared to that of L shaped stairs. It is much more difficult to build but it gives a good finishing for your interior. 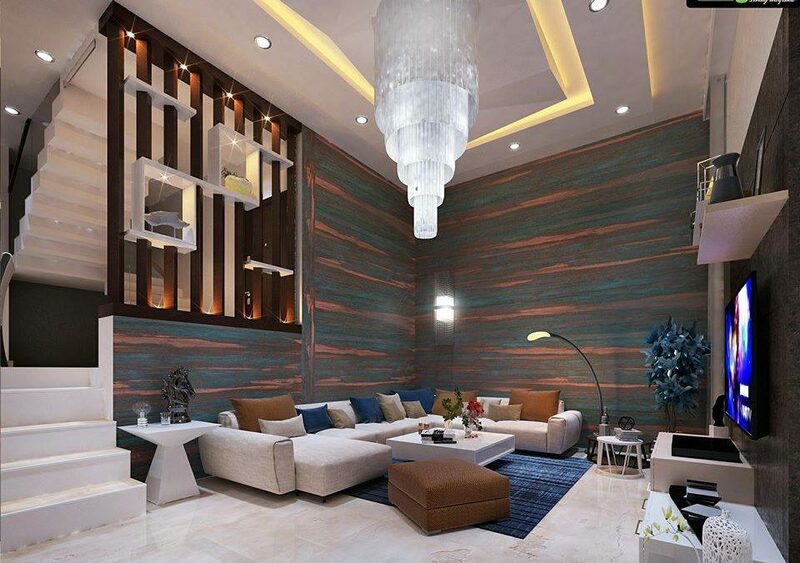 For building such interesting design, contact us at Magnon – Top Interior Decorators in Bangalore. Spiral stair can be further termed as spring stairs. Shape of the spiral stairs looks like a spring with stair’s being mostly attached to a pole in the center. They are very much attractive compared to other types of stair. These types of stairs have a good handrail designs too. One of the main disadvantages of such stair is that it is difficult to carry huge items through this type of stairs. And also single person at a time can only use this stairs. Curved stairs is one other stylish stair which is further meant for the house interior wall having a curved style. It is found that most of the people have the misinterpretation that the curved stairs and spiral are same. For the fact this both are entirely different although they have a similarity of helical in look. This type of stair is not mostly considered by many as stair, as they imagine it as only a ladder. But the fact is that this type of stair is good at space saving and mostly used in libraries. For most of great designs, contact Magnon, the best Interior Decorators in Bangalore and make home interiors look the best.